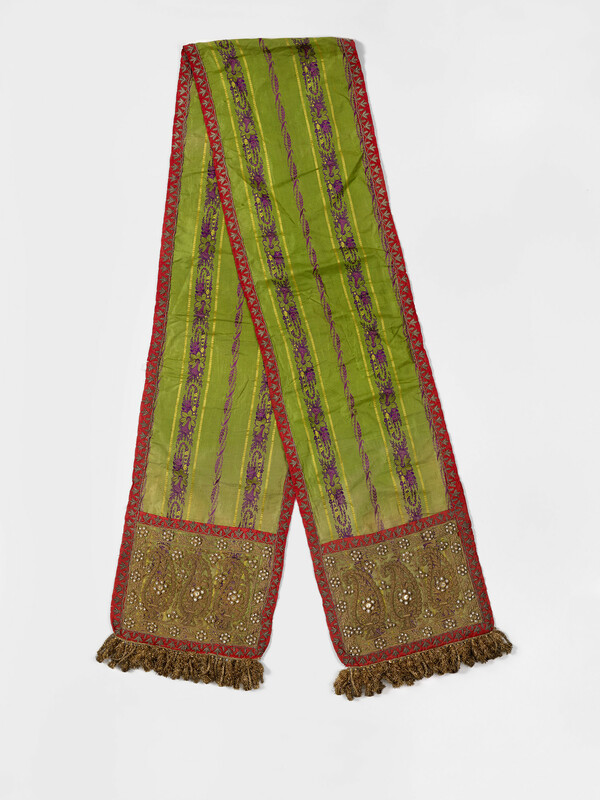 A green silk brocade sash or patka edged with pink silk, embellished with couched silver-gilt embroidery. The ends of the sash also thickly embroidered with silver-gilt thread to represent three paisley motifs. The ends are further embellished with diamonds and pearls arranged in floral motifs. The ends fringed with gold wire or zari. The green silk textile woven with flowers and wheat in purple silk is probably of European origin and imported to India. The textile is marked with a purple tax stamp reading 'Octroi 678', a tax levied by the state of Kashmir on imported goods. The sash was embroidered later, probably in the region of Punjab where zardozi embroidery was prominent.